"A fundamental stipulation and Palestinian commitment of the Oslo peace process was to abandon the use of violence as a means to achieve the Palestinian goal of self-determination." "Four days earlier, as PMW also revealed, Abbasâ€™s Fatah faction posted an anti-Semitic diatribe on its official Facebook page." "While it might be premature to eulogize PA Chairman Mahmoud Abbas, his recent actions demonstrate beyond any doubt that the most prominent legacy of his 15-year presidency is to reward terrorists at the expense of law-abiding Palestinians." The image shows terrorist Thaer Hammad, who murdered 10 Israelis. Posted text: “Eleven Israeli soldiers (sic., 7 soldiers and 3 civilians) were killed and nine others were wounded in a quality operation (i.e., terror attack) next to Ramallah. 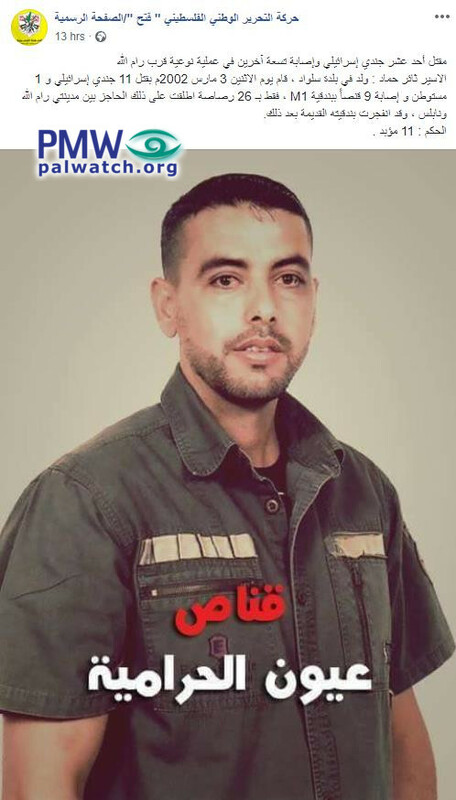 Prisoner Thaer Hammad (i.e., terrorist, murdered 10) was born in the town of Silwad. On Monday, March 3, 2002, he killed 11 Israeli soldiers and one settler (sic.) and wounded nine by sniping with an M1 rifle. Only 26 bullets were fired on that checkpoint between Ramallah and Nablus. His old rifle exploded afterwards.